For small groups (4 to 12 people), enjoy a panoramic view over the Baie des Ha! Ha! 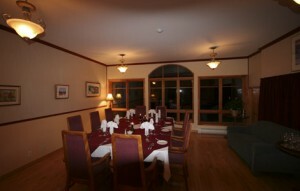 This room can accommodate up to 24 people for a meeting, but it can hold up to 48 people in case of a banquet setting. Largely open unto the surrounding nature and overlooking the bay, this room is outfitted with a fireplace and a piano. This room bathed in natural light, can accommodate up to 100 people for a banquet. For a meeting, this room is ideal for a group of 25 to 50 participants. Different packages are available according to your needs : one day meeting, 2 days with 1 night, Happy Hour, Dinner or anything else. If you are looking for a special activity to enrich your meeting, it would be our pleasure to find something enjoyable for you.